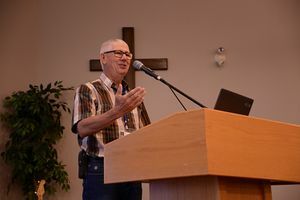 Peter Doerksen served as VCF’s senior pastor since 2014. He has also served as the chair of the EMC’s Board of Leadership and Outreach. Here he reports to the EMC ministerial in June 2017. There were migrations of Mennonites from Manitoba and Minnesota to the Vanderhoof area of British Columbia as early as 1917. Additional Mennonites came from Saskatchewan in 1942, others from the Canadian prairies during the 1950s. The main industry in the area was logging. Around 1968 some people approached the EMC Board of Missions for help. John Harms, a minister at Kola EMC Church and his wife Goldie looked over the situation, and agreed to lead the work. Services began in their home in 1969. The group soon moved into Martens Hall. Giesbrecht, Sierra and Terry Smith. "Vanderhoof Christian Fellowship (Vanderhoof, British Columbia, Canada)." Global Anabaptist Mennonite Encyclopedia Online. August 2017. Web. 25 Apr 2019. http://gameo.org/index.php?title=Vanderhoof_Christian_Fellowship_(Vanderhoof,_British_Columbia,_Canada)&oldid=155815. Giesbrecht, Sierra and Terry Smith. (August 2017). 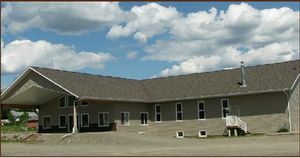 Vanderhoof Christian Fellowship (Vanderhoof, British Columbia, Canada). Global Anabaptist Mennonite Encyclopedia Online. Retrieved 25 April 2019, from http://gameo.org/index.php?title=Vanderhoof_Christian_Fellowship_(Vanderhoof,_British_Columbia,_Canada)&oldid=155815.